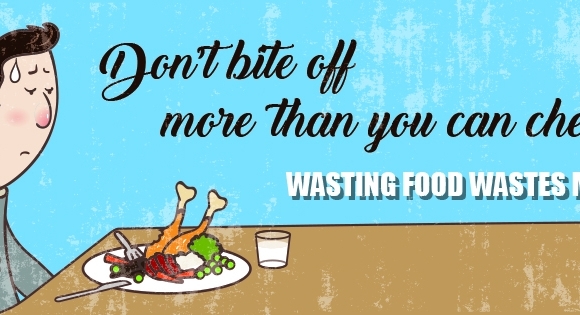 On average, each household in Ireland throws away about €700 worth of avoidable food waste each year. This translates into about one third of each weekly shop never reaching the table. On a national level, we dump half a million tonnes of food annually. Reasons so much of our food gets binned include over-buying, incorrect storage, failure to use food before it expires and sometimes a lack of cooking skills. Wasting food is also a waste of the energy, water, land and labour that has gone into the production and distribution of that food. The cost of wasting food is not restricted to our pockets and our resources, however. There is an important, but often hidden, environmental price to pay for wasting food. Organic waste that ends up in landfill can break down to produce materials that pollute our soil, water and air. While landfills in Ireland do have adequate safety measures to mitigate this pollution risk, we are still obliged to follow EU legislation in reducing the volume of organic waste to landfill. Wasting food can also contribute to climate change. As food breaks down into its constituent nutrients, climate change gases, such as methane, are released into the atmosphere.This means that preventing food waste is an important, albeit often overlooked, climate change mitigation measure. With some thought, planning and a little kitchen creativity, it is possible to reduce food waste and help both your pocket and the environment. Easy tips for preventing food waste and saving cash! 1. Check your fridge and cupboards to see what you have – or take a pic on your smart phone!